Different soils have different dispositions. Soil can be acid, alkaline or neutral. Most plants prefer a soil with a neutral or slightly acidic pH level. The pH scale ranges from 1 to 14, with 7 being the mid-point. The mid-point of the pH scale is called neutral, and means that the liquid in the soil contains an equal amount of hydrogen and hydroxide ions. As the number decreases, the soil becomes more acidic, and as the number rises, it becomes more alkaline. Most plants thrive with a pH level between 5.5 and 7.5. The optimal pH is usually between 6 and 6.5, so if your soil measures above or below this, it may be a good idea to do something to it to improve the nutritional uptake for your plants. At extreme values, below 3 or above 8, the soil becomes an inhospitable environment for plants. The nutrients in the soil cannot be absorbed; the structure of the soil changes and life cannot be supported. The vast majority of plants are co-operative enough and will be content even when the pH level of the soil isn’t quite right for them. But many plants will reward you handsomely if you adjust it. Here are a few desirable pH ranges to strive for if you want to grow strong, healthy, productive plants. It is possible, with some pH meters, to push the meter directly in the soil to obtain a pH reading. However, for a more accurate reading we would recommend following these simple steps. Take away the top layer of the soil, approx 1”. 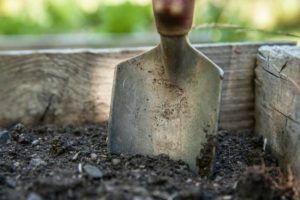 Break up and crumble the soil to a depth of about 6” depth. Take your soil sample from this layer of broken up soil. You will need about 200ml of soil. Pour the soil into a large jar with a lid. Add distilled water and stir. You should use two parts water to one part soil. Put the lid on and shake for at least 2 minutes. Allow the soil to settle at the bottom for at least 10 minutes. Dip your pH meter or litmus paper into the water above the layer of sediment at the bottom. Read and make a note of the results. Repeat this test in several locations if you think the results may differ. Once you know the pH level of your soil, it’s easier to take the right steps to improve it. Generally, you can achieve a well balanced soil by adding quality compost, like bokashi pre-compost. Lime is a quick shortcut to a higher pH level. If you need to quickly lower the pH level, you can mix in peat based compost. Altering the pH of your soil takes time. Do not expect rapid changes.Instead, work steadily towards building the ideal soil conditions for your plants. Does bokashi compost increase the acidity of the soil? 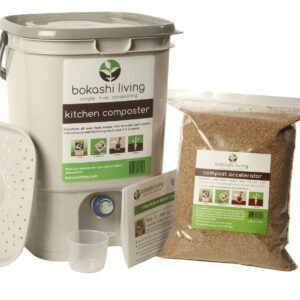 Bokashi pre-compost and bokashi tea are both acidic. The pH of the bokashi pre-compost and bokashi tea can be around 3-4; fairly acidic. 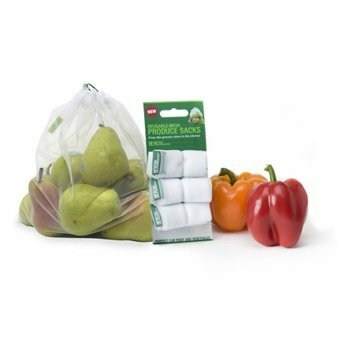 This acidity elimates fruit flies, rodents and pathogens from the bokashi compost. Many gardeners ask whether adding bokashi tea and bokashi pre-compost to their gardens will increase the acidity of the soil. In the short term, yes, the acidity of the soil adjacent to the bokashi pre-compost will rise slightly. However, the soil web will quickly work to neutralize the bokashi. 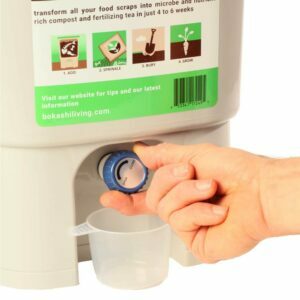 Tests show that within a week or two of burying the bokashi, the soil pH neutralizes completely creating an ideal environment for your plants to thrive.